39 West Press, 9780990864912, 168pp. In his most definitive collection of poetry to date, j.d.tulloch deliberately revisits his previously published Road Rhymes, reworking and synthesizing the truly essential ones with a generous selection of new poems. 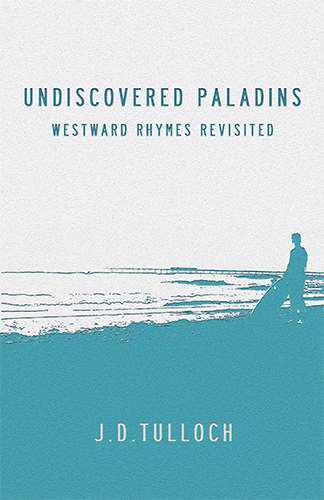 Undiscovered Paladins: Westward Rhymes Revisited emerges in the present but never overlooks (nor fails to consider) the intertwined nature of its fleeting past and immutable future, which courtesy of current technologies are now etched together on the Internet for electronic eternity. It embodies the spirit of existentialism, prospecting everyday life west of the Mississippi for an authentic American Dream while simultaneously chronicling the absurdity of the American Reality: being human in the twenty-first century. From the political correctness amok of progressive Portland to the narcissistic quest for celebrity during pilot season in Hollywood, from the ostensible permanence of the regal redwoods of Humboldt County to the fleeting tides of the pristine beaches of San Diego, and from the tech-generated, data-mined wealth inequality of San Francisco to the addiction-fed rampant greed of Las Vegas, these interconnected poems rely on j.d.tulloch's autonomous voice-which employs melodic rhythm and language, vibrant imagery, and inspired acumen-to carefully guide the reader through snapshots of time that capture both the majestic beauty and ruthless brutality of the modern, American West.